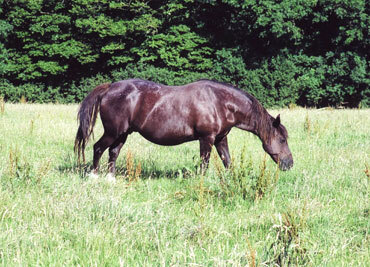 Liver chestnut mare; SHBGB Graded mare. This stunning, traditional cob mare shows all the quality of her sire’s line. She has tremendous presence, is very intelligent, has terrific movement and great personality. All these qualities have been passed onto her foals. Brechfa Hywel (Sire: Arms and the Man) and Brechfa Ninian (Sire: Rumexico) are competing successfully.